Two hundred black pond turtles that were smuggled out from Sindh to China were brought to the Indus Dolphin Centre in Sukkur on August 22, 2014. The Chinese authorities handed over the turtles to a Pakistani delegation comprising Sindh wildlife department and World Wide Fund for Nature-Pakistan (WWF-P) officials at a ceremony held at the Pakistan-China border at the Khunjerab Pass. “The rescued hard-shell turtles will be released into their natural habitat soon once they are rehabilitated at the Dolphin Centre that has been declared their quarantine,” said Sindh Wildlife conservator Javed Maher. The Chinese arrested two Pakistani and five Chinese poachers who would likely get life imprisonment. Earlier, such criminals were awarded the death penalty. In May 2010, the Wildlife Minister had informed the Sindh Assembly about the kinds of turtles found in Sindh, namely the marine turtle, green turtle (Chelonia mydas), olive ridley (Lepidochelys olivaeea) tortoise-1, Indian starred tortoise (Geochelone elegans), freshwater turtle or terrapins, brown river turtle (Kachuga simithi), Indian flap-shell turtle (Lissemys punctata), Indian soft-shell turtle (Trionyx gangeticus), Indian peacock soft-shell turtle (Trionyx hurum), Indian saw-back turtle (Kachuga tecta), black or pond turtle (Geoclemys hamiltoni), narrow-headed soft-shell turtle (Chitra indica) and Brahaminy river turtle (Hardella thurjii). Explaining the steps taken by the government to protect the species, he said that the Sindh Government had declared all marine turtle species ‘protected’ under the Sindh Wildlife Protection Ordinance 1972. The Minister also told the Assembly that during the period 2008 to 2010, 22 cases had been registered for illegal trapping and trading of freshwater turtles, and Rs 242,000 had been recovered as compensation and value of property. Besides, he said the government had banned export of all reptiles, including marine and freshwater turtles and tortoises, under the Pakistan Export Policy, 2006-2007. Generally in Pakistan, eight different species of freshwater turtles are found; five of them are globally threatened species, namely Indian soft-shell turtle, Indian peacock soft-shell turtle, Indian narrow-headed soft-shell turtle, Indian flap-shell turtle, black spotted (pond) turtle, Indian roofed turtle, brown roofed turtle and crowned river turtle. All eight freshwater turtle species are listed in the CITES (Convention on International Trade in Endangered Species of Fauna and Flora) Appendices I & II that means their import and export without a legal permit is prohibited. These turtles are found in the entire Indus River system. These turtles are found in the entire Indus river system. Freshwater turtles were included in the Schedule III (a category of highly protected animals) of the The Khyber Pakhtunkhwa Wild-Life (Protection, Preservation, Conservation & Management) Act 1975 (Act No V) through a notification issued on August 22, 2007 while in Punjab the notification for their inclusion in Schedule III was issued on November 30, 2007. The street value of this consignment was estimated at Rs 30 million. 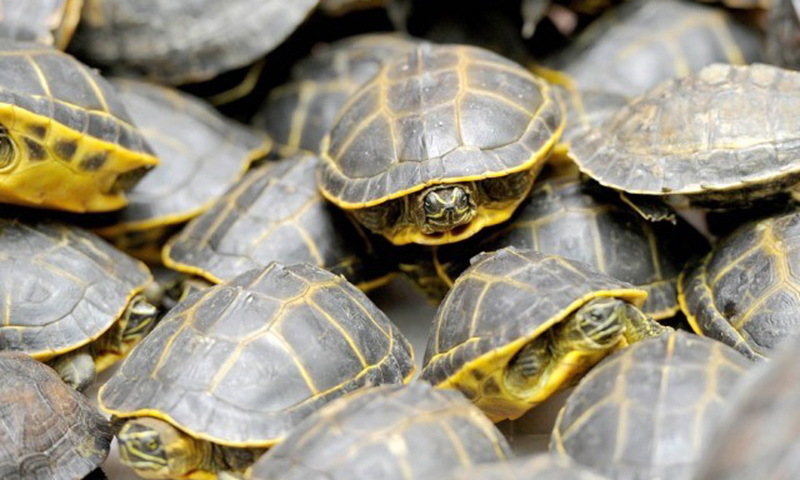 China is said to have death penalty for turtle smugglers. In Pakistan, despite stringent wildlife laws and heavy staffing in the provinces, the smugglers continue to pass freely. The customs staff at Sost border also take their share from the smugglers. Despite the booming illegal trade of freshwater turtles that has been going on for many years in the province, the Sindh government has yet to accord protected status to the species. The smuggled 200 black pond turtles (Geoclemys hamiltonii) are presently undergoing rehabilitation in the Dolphin Centre, Sukkur, which has been declared their quarantine. Investigation showed that the consignment was sent from Sindh. A consignment of black pond turtles was also confiscated in 2013 in Bangkok. A Pakistani national was held on suspicion of wildlife trafficking at the airport after four suitcases on a flight from Lahore were found containing hundreds of black pond turtles. Interestingly, freshwater turtles, an important species of the local ecosystem, are not protected under the Sind Wildlife Protection Ordinance 1972 (Ordinance No V), which is being followed since April 13, 1972. The ordinance specifically talks only about marine turtles. No notification for species conservation exists either. “All marine turtles of the genera Dermochelys, Chelonia, Caretta and Eretomochelys ie, all leatherback, green or edible, hawksbill, loggerhead and tortoise-shell turtles,” says the Sindh Ordinance in its list of protected animals. The recent turtle seizure in China is not an isolated incident and it indicates the large scale that the illegal trade has. The animal rights activists question the ‘negligence’ of the Sindh Wildlife Department (SWD) for never issuing a notification for species’ protection in this regard. 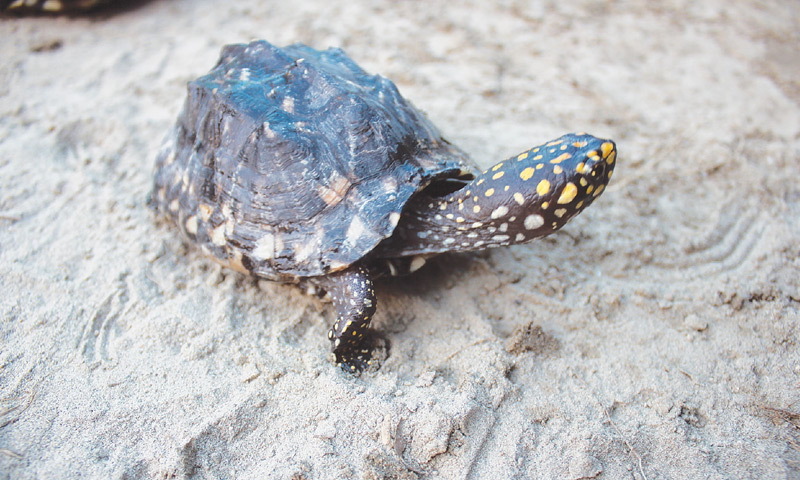 “The reason why the department never bothered to issue a notification to prohibit the species’ hunting should have raised concern in wildlife circles as this loophole helps department officials ignore/allow species’ hunting,” said an official of the department, claiming that there had been instances in the past where the SWD issued no-objection certificates for freshwater turtles’ export. On the question of wildlife department officials’ involvement in the illegal turtle trade, Sindh Conservator Wildlife Javed Mehar said that he didn’t want to comment on the happenings of the past, but now as he headed the department every step was being taken to discourage the trade. “Though freshwater turtles are not protected under the Sindh Ordinance, we look at the CITES as our own law that prohibits turtle trade as Pakistan is a signatory to the international convention. Besides, turtle export is banned under federal laws,” he explained. The Department, he said, had submitted an updated version of the wildlife law that accorded protected status to all local fauna and waiting for its approval from the government. The only data available on freshwater turtle trade is of the Pakistan Wetlands Program of World Wide Fund of Nature-Pakistan that conducted surveys from 2007 to 2009 to investigate turtle trade in Khyber Pakhtunkhwa, Punjab and Sindh. The surveys confirmed that the illegal turtle trade was going on in all the three provinces. The stretch of the Indus River in Sindh and its major canals and tributaries, in addition to the Kotri, Sukkur and Guddu barrages, were studied during the survey that revealed that turtle trade was taking place throughout the region while the business was introduced at major barrages of the Indus River in 2003. “Illegal trade is a major threat to turtle survival in Pakistan that has brought a significant decline in their number over the years. What we have seen over the years is that poachers, who were earlier targeting only soft-shell turtles, are now also catching hard-shell turtles,” said Uzma Noureen, who has been researching freshwater turtles for many years and is currently working as project coordinator of WWF-P’s Indus River Dolphin Conservation project. The current population status of the species in Pakistan is unknown, though some past studies exist. Known as scavengers, the turtles feed on dead organic matter in the water and play a very important ecological role in cleaning water, she said. “Freshwater turtles being the most important component of an aquatic ecosystem need to be protected and conserved on a priority basis and the Sindh government must act in this regard. “Wildlife and customs authorities deputed at exit points [sea ports, airports, provincial and country borders] should be well trained in identifying species and their body parts. Local communities should be sensitised to and made aware of the ecological role and importance of turtles in aquatic ecosystems,” she said.